A small, slow growing, low branched tree with white bracts in the spring. 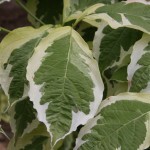 The leaves are olive green, variegated with yellowish-white, sometimes tinged pink. 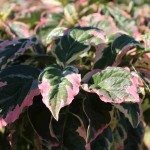 The leaves tend to sunburn less at the edges than other cultivars. The fall color is pink to deep red. 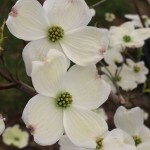 Flowering Dogwoods prefer moist, well-drained soils in full sun to part shade. Introduced in the late 1980's by Commercial Nursery as 'Daybreak'.